Sole Magazine, The Event Issue. A key-content element of the annual Sole DXB festival, the magazine has evolved into a stand-alone project with a longer format that will explore and promote global street culture through fashion, music, art and urban sport features curated by internationally recognised contributors. The first issue of the magazine focuses on independent talent from South Africa, India, Turkey, UAE and more. As such, the inaugural issue sees two different covers of South African rapper Sho Madjozi—one by Maxwell Aurelien James and another by Andile Buka of The Sartists. The cover story, shot in Johannesburg with the support of MAC Cosmetics Middle East, encapsulates Sole’s journey within South Africa, produced by emerging South African designers, creatives and curators. They exemplify Sole’s cultural exploration of people and stories found in countries peripheral to the Middle East that are not often given a platform to speak. MAC Cosmetics Middle East portray these same ideals of inclusivity for All Ages, All Races and All Genders. Articles include pieces by headline artist Nas, renowned industry writers such as The New York Times Magazine contributor Eve Fairbanks and Sterogum’s Tom Breihan, cover a variety of topics; from the rise of Gqom music in South Africa and the basketball communities in the Philippines, to the language of Indian Hip-Hop. Their contributions give a hint of what you can expect at this year’s Sole event, and across the global cultural scene with voices of underground and upcoming talent being put forward. 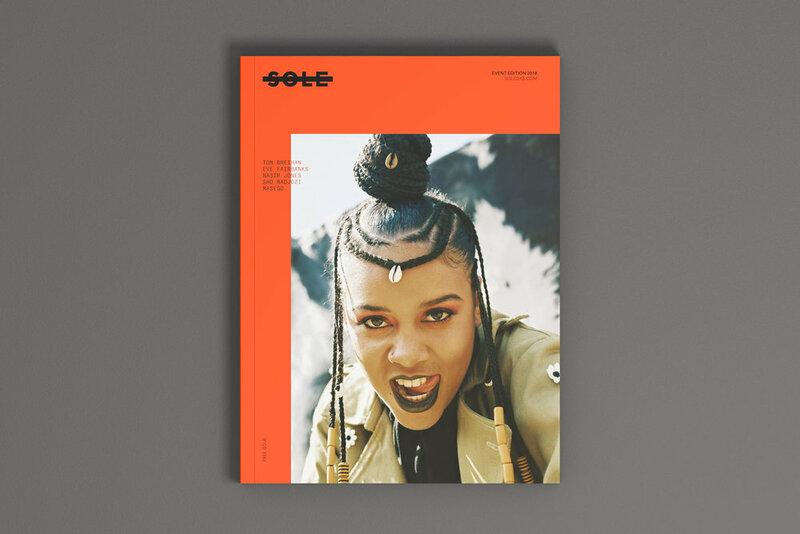 With a 10,000 copies run distributed across regional locations as well as select international doors, the magazine’s first issue features photo essays, interviews with headline artists and sneakerheads, opinion pieces and editorial content shot in the region and abroad by such brands as Gucci, Farfetch and Saint Laurent. What’s more, it presents, for the first time, a bespoke shoot by Sole for their concept store Early Retirement. The Sole Magazine Event Edition is on shelves now. It can be found regionally in participating brands including Amongst Few, FRAME and International outlets and art galleries in London, South Africa, New York, Berlin and Paris.